Sky High Gallery is very pleased to be hosting the first Milwaukee exhibit by San Francisco based artist Kyle Ranson. He will be spending the week in the gallery painting a site specific mural for his show "Ships". 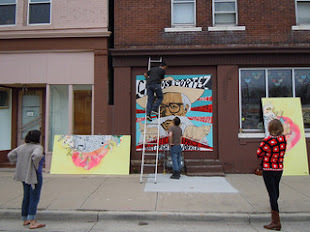 In addition to the mural he will be installing paintings and performing a special set of music at the opening event. With an encouraging hippie mother, Kyle Ranson began to draw and paint in early childhood and by the time he was in high school he was taking life-drawing classes at the Lyme Academy in Connecticut. He attended three semesters at the Maryland institute, College of Art and then dropped out to immerse himself in the arts and music scene in Baltimore. In 1994 he moved to San Francisco and became a part of the underground punk scene in the mission and has slowly become a pillar of the San Francisco art world. The Temporary Mural Project is an outdoor 8'x 8' space on the East wall of Sky High that we utilize as a rotating public art space. 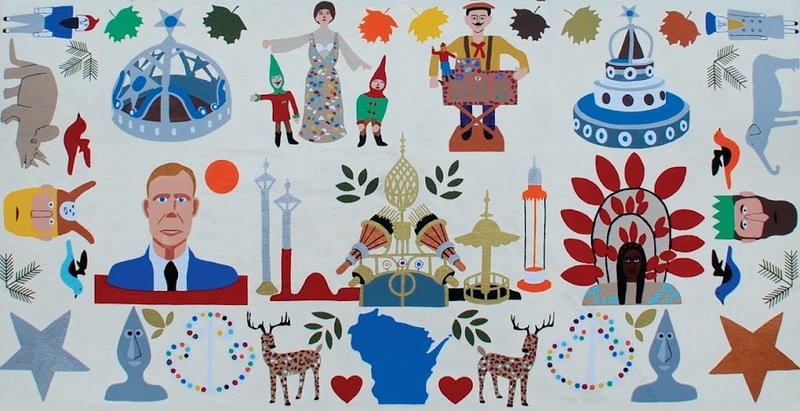 Selected Milwaukee artists are asked to create an 8' x 8' piece of work in their studio that is then installed on the wall for durations of approximately 3 months. These temporary murals are intended to brighten the community, promote creative growth and inspiration in our neighborhood. The mural project also gives the artist 24 street side exposure. Our long term goal is to find a outdoor location to reinstall 2 years worth of murals for the public to view at once. Postcards of each mural are printed in small editions and available for free while supplies last in the shop. Come by and see it for yourself. In July 2010 the stock room of Sky High Skateboard Shop became Sky High Gallery and we celebrated our grand opening. We feature rotating exhibits by contemporary emerging artists, screenings and events celebrating art makers & has hosted a handful of holiday pop-up shopping events. Sky High aims to inspire locally by bringing in fresh new work from around the world. Gallery curator Faythe Levine (2010-2013) & skate shop owner Aaron Polansky share a common vision for making their city a better place by building community through art, creativity and events centered around their neighborhood in the Bay View neighborhood of Milwaukee. Please do not use content from this website without asking permission. Print ready images available upon request.